Welcome to the BetPhoenix Racebook, where you get full track odds for your online horse betting action and win BIG with a 15% rebate on your all your horse bets EVERY week! If you're new to horse betting, you should know that it's among the most exciting type of wagering. Races last approximately 1 minute and 30 seconds, so you’ll get your heart pumping and adrenaline flowing as you follow the race. When you win, your account is credited within minutes after the race is finished. Best of all, you get some of the highest house payout limits in the industry. If you're looking for horse betting online, read through our horse betting rules to learn how to bet on the ponies with your BetPhoenix account. Get information on horse racing betting on the Triple Crown races. Also find all of the details on the Kentucky Derby betting, Belmont Stakes, and the Preakness Stakes. The horse betting action never stops at BetPhoenix and neither does your bonuses! 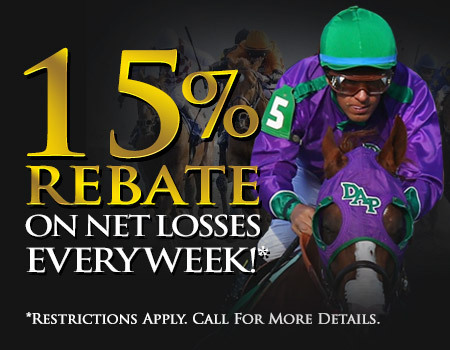 Get a 15% Weekly Rebate on all your horse bets.